Conestoga Community Playground in West Philadelphia sits one block from Lancaster Avenue, the commercial corridor linking Center City and its more affluent suburbs. Traveling along the corridor, significant economic disparities emerge, underscoring the need for a more equitable distribution of - and access to - parks and green spaces for the City's residents. The Trust for Public Land and the Mural Arts Program worked in partnership with the Caroll Park neighborhood to create a community space that embodies healing and transformation. The goal for the park was to express an aspirational vision while supporting active recreation and social cohesion. 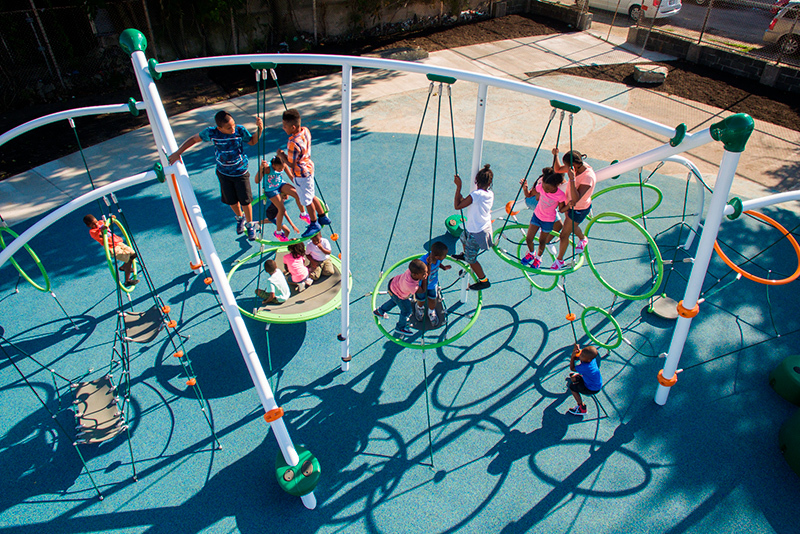 Two new playgrounds, a sprayground, gathering spaces, a community garden and stormwater management features are organized along a spiraling path etched with oak leaf imprints. Through an ethnobotanical study of the neighborhood, we learned that Oaks hold an importance for residents. In response, we planted Oak trees of multiple varieties throughout the park. The sustainable design includes adaptive reuse of materials, benches carved from tree trunks and pavers assembled from wall cladding.